The second wallpaper I made. It followed my Naruto Rasen Shuriken after one week. I read a lot of tutorials on making flames, and all that reading made me crazy. 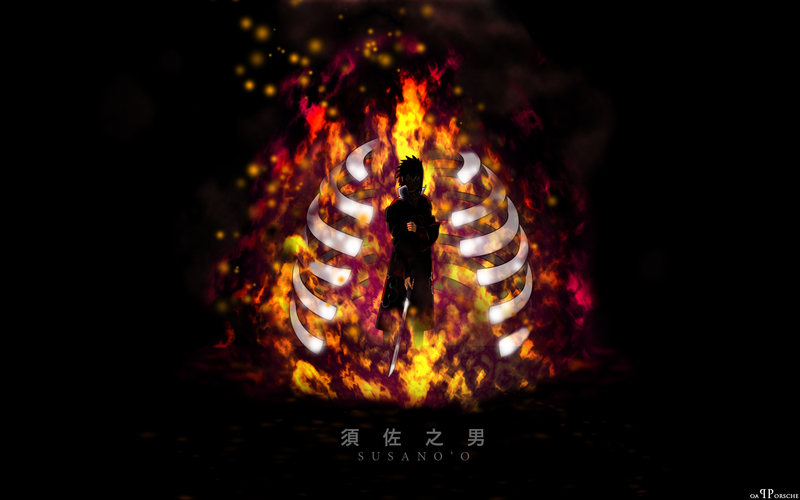 Here I wanted to show that Sasuke is using his most powerful jutsu, Susano. And since he was already consumed by hate, I wanted to use fire to have a hellish effect. The ribs were the very first time I tried to vector. Kudos to Nysha for showing me how. Hope you enjoy this one too. It's the very first time that I see a wall with Sasuke unleashing the Susano'o technics. Cool Wallpaper of Sasuke especailly him in the middle in the shadow and flames around. Good idea in making it. Love the wallpaper. Like the dark black background and the glowly red effect around Sasuke. Very awesome work.